We employ over 1,000 Shift Managers across our business - the majority of whom have come up through the ranks from Team Member or Driver positions. Through dedicated coaching modules and classroom training days, we’ll give you the early responsibility you crave and equip you for your first or next step on the management ladder. The role is fast paced, and full of variety, motivating your team and engaging with customers. If you share our passion for growing a business, with every shift you'll learn and grow as a leader - the role is a great stepping stone to becoming a General Manager in our expanding business. Fact: 90% of our General Managers are promoted from Shift Manager positions, supported with our amazing training programme. Our Team Members are the energetic all-rounders at the heart of every operation. The pace is fast, but you get a great feeling from pulling together and getting tasty food out as a team. No two days are ever the same as you get to experience working across our reception and kitchen, so it's a job that always stays fresh. Behind the scenes, there's always lots to do like organising orders, prepping side dishes, cooking the pizzas and keeping everything spotless. We’re looking for people who will bring their outgoing personality and customer service skills to the fore. And for those that want to progress, we will invest in your training and your career. Fact: Our team members regularly develop their skills to become experts in all areas of the store. Many go on to complete their management training earning more money and greater responsibility. Pizza Hut Delivery has a great brand, a great product and a great business model, but it still takes top-notch leaders like you to make our stores a success. You need to be an enthusiastic, passionate leader of people, and be able to perform at your best when the pressure is on. And you need the confidence to take quick decisions and assume accountability for them. The job will call on you to develop yourself and everyone around you, while using your commercial awareness to grow the business, alongside your team. The responsibility, recognition and rewards are a deserved return for giving your all. Fact: Every year we reward our top 10 General Managers by inducting them into the ‘Champions Club'. We've whisked them away to locations such as Barcelona and 5* Luxury Country Hotels, provided helicopter rides and car racing experiences' at Grand Prix circuits to name but a few benefits. We are investing heavily in our Express brand. You can find them in shopping centres or anywhere where people may want a delicious pizza on the go. Fact: Express is one of the fastest growing parts of our business and over the coming 12 months we’re going to be opening up new stores nationwide. We call our St Albans Head Office the Restaurant Support Centre because that's what we do; support our Restaurants to deliver hot and tasty pizzas to customers across the UK and Europe. Our RSC team is made up of more than 150 colleagues providing knowledge, guidance and commercial support to franchisees across more than 25 countries. Our RSC houses a wide range of roles including Marketing, Finance, Technology, Supply Chain, Food Safety and HR and offers fantastic career opportunities. We are a friendly bunch; we work hard and have fun doing so, and believe in providing continuous development to help us all become our best. Fact: Many of our top performers move to bigger roles with Yum! Brands overseas. 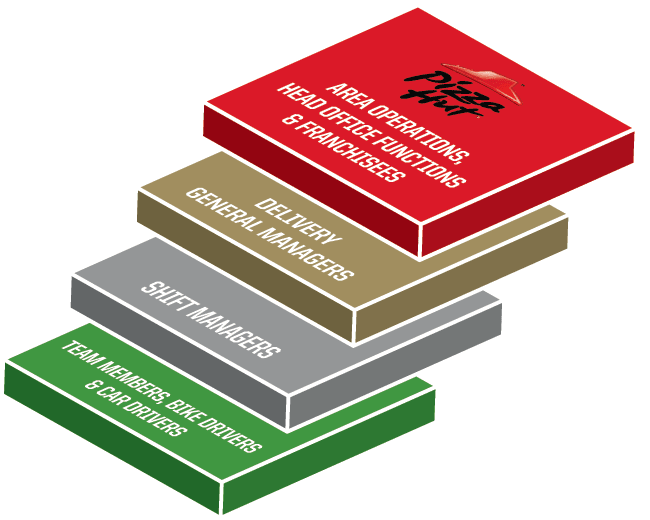 The Pizza Hut Delivery Shift Manager Apprenticeship Programme equips you with the skills and knowledge to reach your full potential as a leader. Through dedicated coaching modules and training workshops, this 12 month programme will give you the early responsibility you crave. You will gain an accredited Level 3 qualification (Hospitality Supervision and Leadership Diploma) with support from a specialist vocational learning coach and your peers within your Hut. We are looking for leaders who want a long-term and fulfilling career with us; therefore on successful completion of your apprenticeship, we will aim to provide you with a full-time leadership role within the business. Fact: 83% of apprentices said their ability to do the job and their career prospects had improved since completing an apprenticeship programme. With over 400 Delivery and Express stores across the UK, you can find us in just about every major city and town - meaning you're never far from a great career opportunity with Pizza Hut Delivery. We're always on the lookout for Drivers and new Team Members who share our passion for customer service, teamwork and of course, amazing pizza! If you work in a store, the career path at Pizza Hut is crystal clear. Our business is full of people who've climbed the ladder. They're the living, breathing proof of how much we care about progressing careers. At the Restaurant Support Centre, we're big on promoting from within and developing our own leaders. Many of our high potential employees start off in one department and then cross functions into another, for example Finance, or HR. As part of Yum! Brands, we have can open up opportunities to progress in KFC and Taco Bell too - which can even mean working in other international business markets. Exciting opportunities also exist away from our stores for those with the desire and ambition to progress. At Head Office, many of our high potential employees start off in one department and then cross functions into another, for example Finance, or HR. You’re now in charge of your own unit. But your career ambitions don’t have to stop there. Some DGMs choose to progress on to regional management and head office roles. Prove yourself in this role progress into our structured General Management training programme. Once you’ve completed Team Member training you can start applying to Shift Management positions (we have plenty as we are opening many new stores).